A few years ago, no one knew who Janet McTeer was. An Academy Award nomination later, she's still not a household name; however, she's pretty popular in indie circles, having received positive critical attention for her leading role in the wonderful but little-seen film Songcatcher. Likewise, Kristian Levring might also be a name that rings familiar due to his involvement in the creation of the Danish Dogme Manifesto. Along with Lars von Trier, Thomas Vinterburg, and Soren Kragh-Jacobsen, these writer/directors established tenets that were most famously used in movies such as von Trier's Breaking the Waves, Dancer in the Dark, and Dogville. The Dogme "vow of chastity" lays out the following rules: shooting must be done on location; sound must not be produced apart from the images or vice versa (i.e. there is no musical score); the camera must be hand-held; the film must be in color with no special lighting; optical work and filters are forbidden; genre movies are unacceptable; the film format must be Academy 35 mm; and the director must not be credited. After following those principles fairly strictly in The King Is Alive, Levring is following up with the Dogme 95 "inspired" drama The Intended. 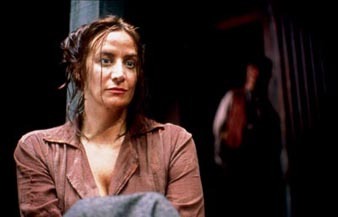 Levring co-wrote this tragedy with significant other McTeer, who also stars. The Intended is set during the 1920s in the Malaysian jungle, and is the story of a middle-aged British woman named Sarah (McTeer), who has traveled with her younger fiancé (JJ Feild) to survey the land for an ivory trading post. They arrive at the small town in Borneo and discover that the post is run by an extremely dysfunctional family. The leader of the land is the domineering Mrs. Jones (Brenda Fricker), who is in complete control of her son William (Tony Maudsley) and nephew Norton (Philip Jackson). As Sarah and her young paramour move amongst this strained group, the couple’s optimism and apparent deep love for one another sets off some deep tension that takes a very dark turn, giving a free rein to avarice, murder and even insanity.